​Scleral lenses are large-diameter gas-permeable lenses. They are termed scleral lenses because they rest entirely on the white part of the eye, the sclera. This is different than all other forms of contact lenses which rest on the clear front part of the eye, the cornea. Scleral lenses are custom lenses fit specifically for your eyes. They keep the eye hydrated and provide significantly improved vision where traditional contact lenses and spectacles have failed. 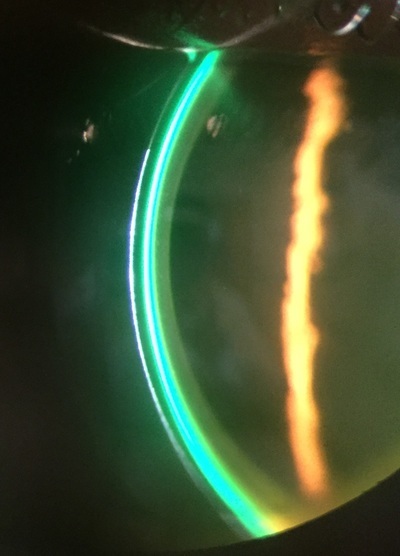 ​Scleral lenses are traditionally fit on patients with irregularly shaped corneas from conditions like keratoconus or pellucid marginal degeneration. They are also useful for patients with significant dry eye disease. Before application, the lenses are filled with sterile, preservative-free saline, creating a uniform tear reservoir that hydrates the cornea. The tear reservoir negates any surface irregularities or deformities, which provides significantly improved vision. ​Patients with keratoconus and dry eye disease are not the only patients who can wear scleral lenses. They are great options for anyone who has tried contact lenses in the past and discontinued wear because of discomfort or lack of visual clarity. They are also fantastic for patients who need extremely sharp vision who play sports or work in dusty environments. ​Dr. Rebarchik has a passion for fitting patients in scleral lenses. He has seen the significant improvement in quality of life that scleral lenses provide patients and is dedicated to help improve your vision. 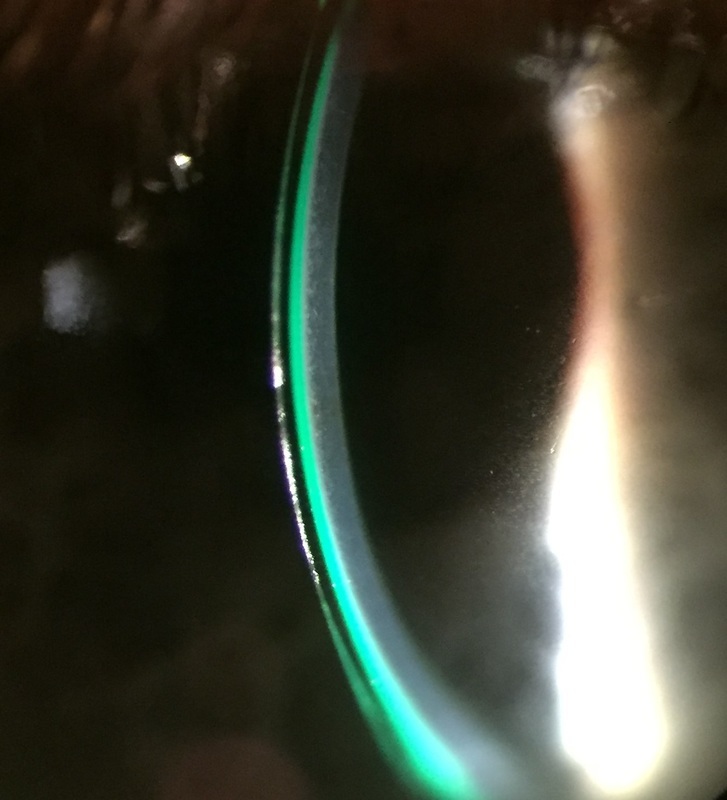 Dr. Rebarchik performs scleral lens fittings in our Lewes office. Before being fit with scleral lenses, an updated comprehensive eye examination is required to ensure you are eligible for scleral lens wear and that you do not have other diseases that may interfere with your scleral lens success. You will also have a corneal topography performed on your eyes to ensure scleral lenses are in fact your best option. The following is a portion of a testimonial from a patient with keratoconus. She eventually required a corneal transplant in both eyes, however her vision remained poor. After failing with glasses and other contact lenses, she was referred to Dr. Rebarchik for scleral lenses. ...I was so overwhelmed having just given birth to my daughter and my vision was deteriorating overnight. I found out that I was going to need two corneal transplants in order to correct my vision. I thought once I had the transplants my vision would be back to normal, but that was not the case. I’ve tried nearly every contact lens out there and been diagnosed with every eye irritation there is...I am ecstatic to be one of your scleral lens patients. My vision is the best it’s ever been and I love the fact that I can sit at my computer and do not have to squint or lean into my computer to see what I'm working on. It has been wonderful to be able to see nature and the world around me in a different way. I can see things that I thought were clean (My family thinks I’m crazy now spotting everything). I can drive at night and my facial muscles can finally rest from squinting all the time. Vision is something so many of us take for granted until it becomes impaired, but every morning while putting on my lenses, I am reminded of how lucky I am. Dr. Rebarchik thank you for taking the time to perfect the curvatures of the lenses so that I could fulfill all of my goals and aspirations. 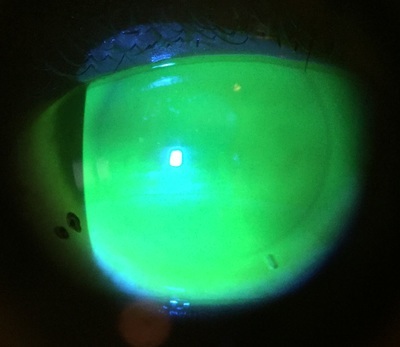 The following patient presented with pellucid marginal degeneration and a history of longstanding intralimbal gas-permeable contact lens wear. He reported the lenses frequently fell out during the day and were uncomfortable, but they were the only option he had for acceptable vision. The first photo displays significant edge stand off (red arrow), the source of his problems. The patient was fit in scleral lenses and now enjoys significantly enhanced vision and comfort. 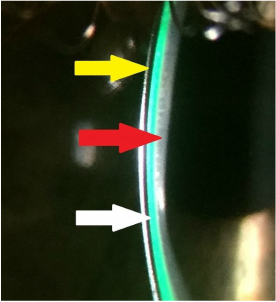 Left image: Red arrow displaying edge of lens lifting off of patient's cornea. 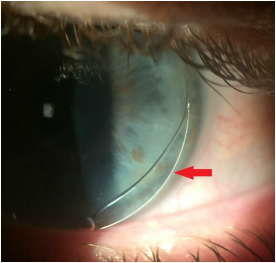 Right image: Scleral lens on eye. Dark band adjacent to yellow arrow is the lens. Green band adjacent to white arrow is the tear layer between the lens and cornea (enhanced with in office dye). 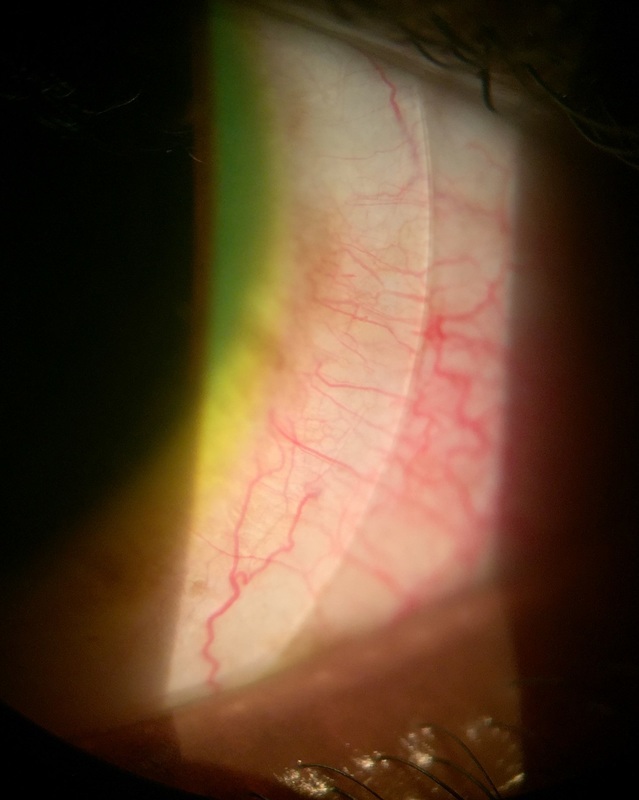 White band adjacent to red arrow is the cornea. The following patient was referred for a specialty lens evaluation. He had a history of unsuccessful soft contact lens and spectacle wear secondary to poor vision. 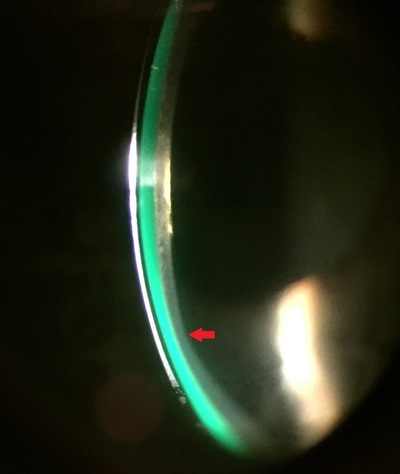 Corneal topography confirmed his reduced visual acuity was due to keratoconus. The patient opted for scleral lenses as he was very athletic and active and was worried smaller gas permeable lenses would be uncomfortable. He was successfully fit in scleral lenses and enjoys better vision than he has had in years. 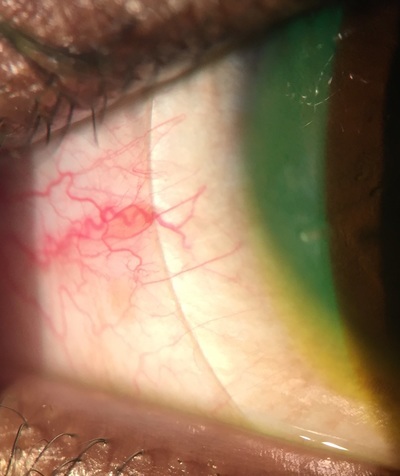 Red arrow displaying the patient's inferior corneal thinning as a result of keratoconus. The following keratoconus patient presented for a specialty contact lens fitting with a history of recent hybrid lens wear. She was experiencing discomfort and redness in both eyes. She was able to see well, however she was unable to wear the lenses for more than a few hours secondary to discomfort. After discussing her options, the right eye was fit with a scleral lens. The left eye was fit with a bitoric intralimbal gas permeable contact lens. One year later she returned stating she was much happier with the scleral lens and wanted to be refit into a scleral lens in the left eye as well. A new scleral lens was designed which allowed her to see exceptionally with great comfort throughout all wearing hours. Top images: Scleral lens on eye with enhancing dye added to evaluate fit. Bottom images: Scleral lens edges landing properly allowing for enhanced comfort.